The proclamation declares October 10, 2018 as Benaroya Hall Day in recognition of the Hall’s contributions to Seattle arts and culture over the last 20 years. Today Seattle Mayor Jenny Durkan proclaimed October 10, 2018 as Benaroya Hall Day in honor of the Hall’s remarkable contributions to the culture of Seattle over the last 20 years. Serving as a landmark for tourists and locals alike, Benaroya Hall signifies the strength and depth of Seattle’s cultural institutions. Home to the Seattle Symphony, Benaroya Hall opened its doors in 1998. 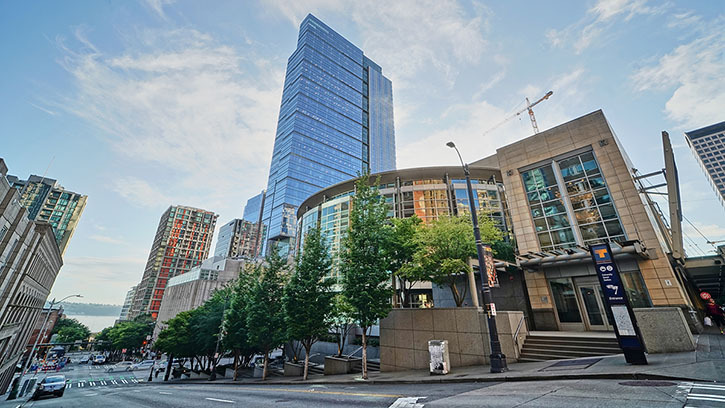 Located on an entire city block in downtown Seattle, the Hall has been instrumental in propelling the orchestra to reach new heights, becoming a cultural landmark of the city. Since its opening, the orchestra has doubled its concert programming, providing dynamic and inventive concerts each season and reaching over 65,000 children and adults each year through extensive education and community engagement programs. Benaroya Hall’s state-of-the-art in-house recording studio and acoustically superb performance space enabled the orchestra to launch Seattle Symphony Media in 2014, bringing the name Benaroya Hall and Seattle Symphony to international acclaim. Building on Benaroya Hall’s legacy, the Seattle Symphony unveiled plans earlier in June for Octave 9: Raisbeck Music Center, slated to open in early 2019. The one-of-a-kind venue will open new opportunities for cross-genre collaborations and allow the Symphony to continue to boldly push boundaries and engage new audiences in its home at Benaroya Hall. Programming for Octave 9 will be announced in November. The Seattle Symphony celebrated its home in a luncheon today with members of the community who helped make Benaroya Hall a reality. NOW, THEREFORE, I, Jenny A. Durkan, Mayor of Seattle, do hereby proclaim October 10, 2018 to be BENAROYA HALL DAY.